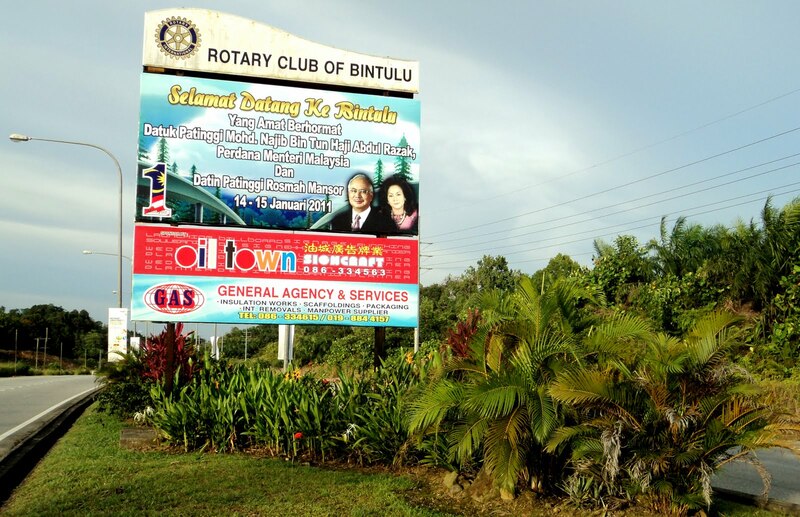 Welcome to Bintulu - home of the best Belacan money can buy. Two things that make Bintulu international. First, from its seas are exported liquefied natural gas. 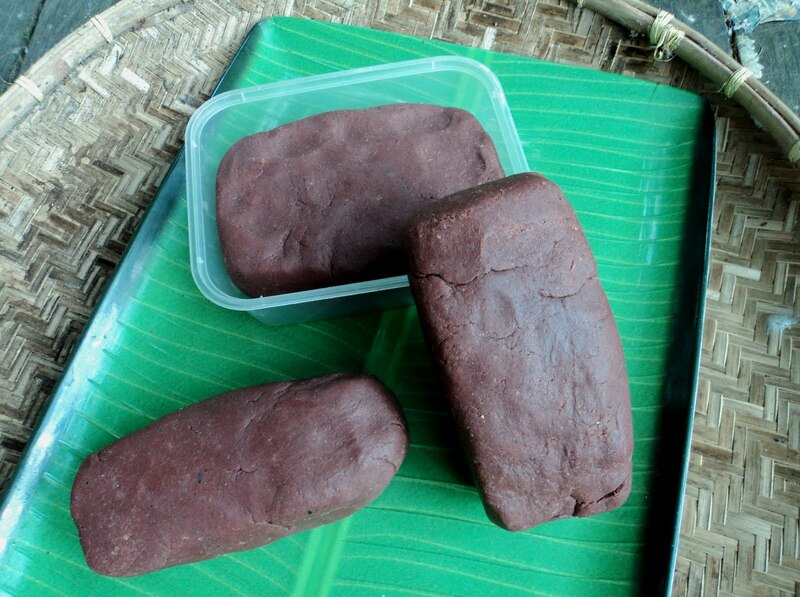 Second, from its coasts ( see inset) are exported the finest and best quality 'Belacan' or shrimp paste. While in Bintulu, this year opening 'Bubuk' or shrimp season have kept me excited to blog about the making of Bintulu belacan. In a year the bubuk season come twice and the next one would normally be in August. 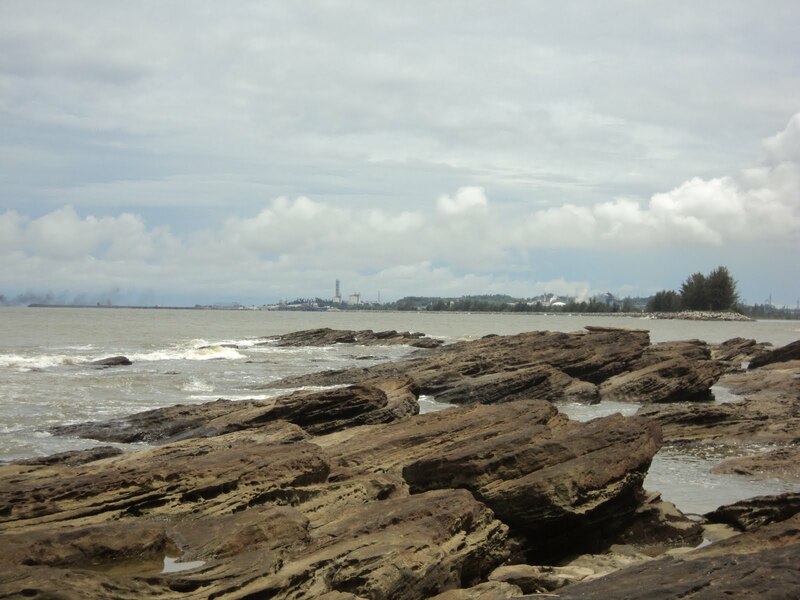 What makes Bintulu belacan simply the best? I think it is the waters off its 14 miles of protected natural park beaches stretching from Likau river to Kuala Similajau river. From its blue and unpolluted coastal waters the local fishermen catch the shrimps in nets and these are immediately brought to town to be sold. Another point worth mentioning is the distinct hot and dry weather here that is ideal for the drying process. Ultimately , I think its the legendary skills of the fishing folks here in the fine art of making the belacan as passed from generations to generations with some recipe kept a family secret. 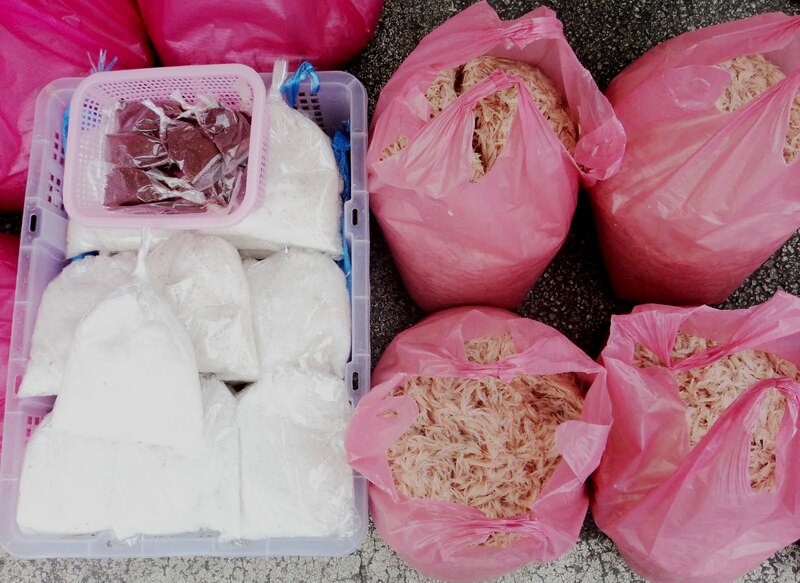 In this blog however I'm about to let some secrets out so that you can try your luck with the smell, the sweat and the blisters or else just fork out RM 60 for a kilo of belacan !. 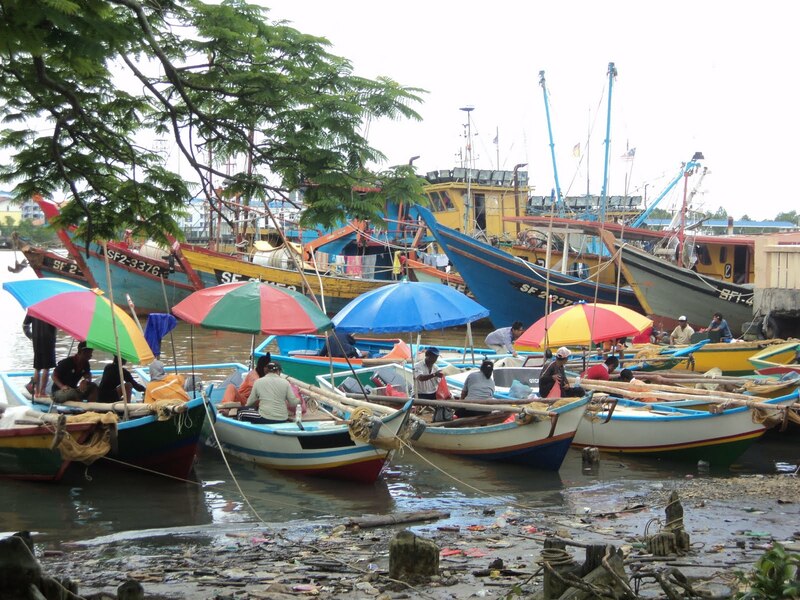 Small fishing boats park nearby the town local market have the shrimps ready packed in ' gantangs'. At the early morning price is inelastic - it's a sellers market. 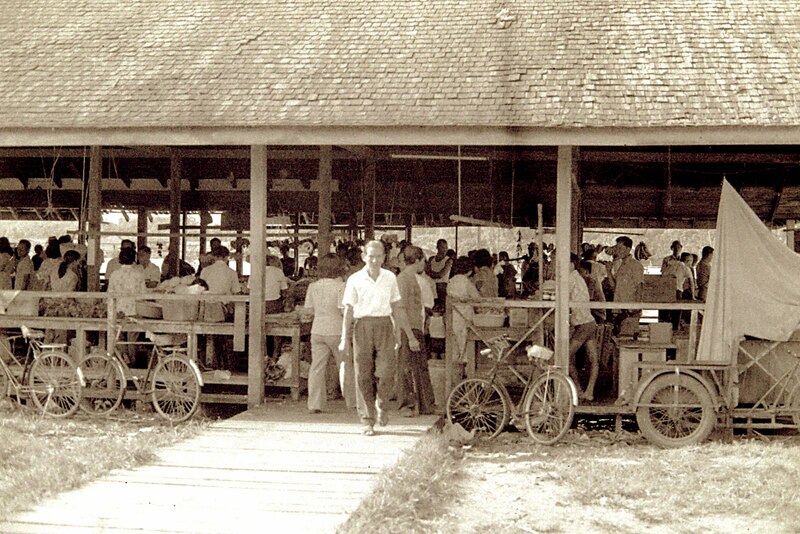 Later in the day when the shrimps are less fresh and the demand less, it's a buyers market. However, when the weather is cloudy or rainy the shrimps can sell much cheaper because there's little sun to help dry them. But then Bintulu's weather is such that when the bubuk season is around there are always days when the sun naturally brings cheer. 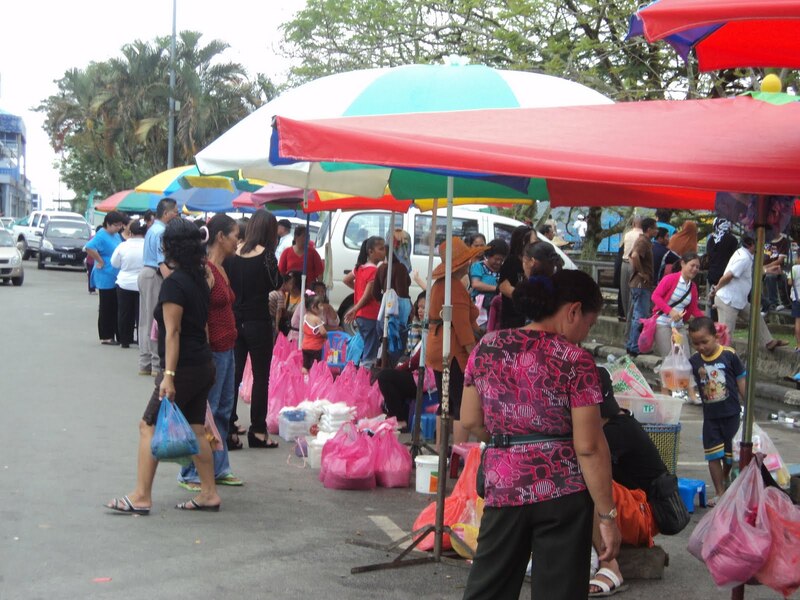 Buying 'bubuk' early morning near to Bintulu's tamu or local market. The season of shrimps in Bintulu has been exceptionally good this year. The fishing folks have been kept busy for a full month now. Before the shrimps land on the negotiation table or roadside market the fishermen have packed them into plastic bags weighing a 'gantang'' which is equivalent to about two and a half kilo. The gantang is always the preferred weight measure for sentimental and traditional reasons, I guess. At the inset is shown the main ingredients for the making of belacan. These are - fresh shrimps, coarse salt, pounded red rice for colouring. The steps in making belacan can be described briefly here. Firstly, the shrimps are marinated with salt and red rice and kept for 24 - 48 hours. Then, it is dried on mats in the hot sun. Next, the men and ladies folks alike pound it into a fine paste. More pictures below. The dried shrimps are pounded in a special vessel called the ' lesung' which is a wooden mortar. In Bintulu, people prefer to use the mortar from the hardest timber species here called the belian. The 'anak lesung' or the pestle is also made from belian timber as seen in picture above. 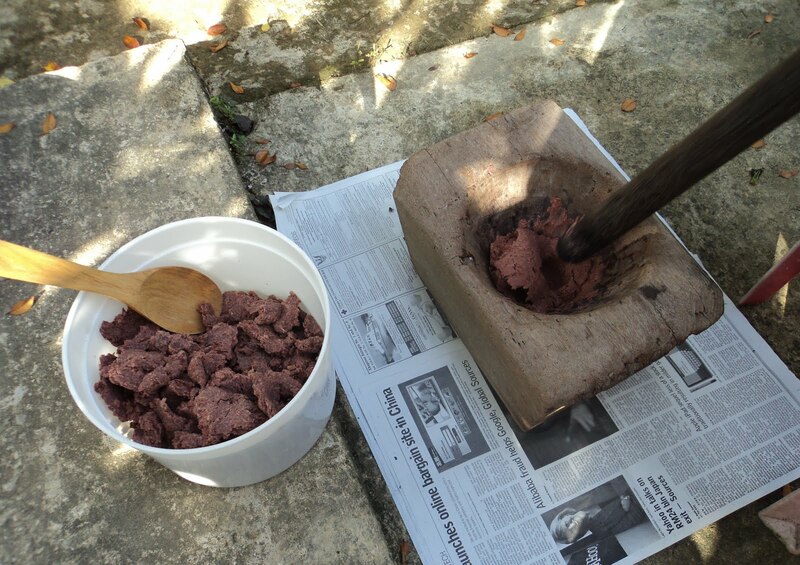 It takes about 2-3 rounds of pounding to obtain a fine paste of belacan. The pounding process can stretch to several days. Above is the finished belacan product. Each piece is about a kilo in weight and the selling price currently in Bintulu tamu or local market is RM 40-60 depending on quality and availability. Normally for a small family a kilo of belacan will last for about a year or slightly less depending on usage. That's about it folks. If you haven't try Bintulu belacan please do so. Put it in your list of 1000 things to do before you die!